As the fourth bishop of Little Rock, Albert L. Fletcher guided the diocese through a period of profound social, racial and theological conflict and change. His 25-year episcopacy spanned the Cold War, the civil rights movement, Vatican II and the Vietnam War. Bishop Fletcher’s calm, courtly manner stood in stark contrast to the upheaval around him. He was the first Arkansan raised to the Roman Catholic hierarchy and remains the only native son to serve as Little Rock’s bishop. Bishop Fletcher was a descendent of distinguished Arkansans. A distant relative, John Gould Fletcher, settled Lawrence County in 1800. Another relative, John Gould Fletcher Jr., earned the Pulitzer prize in poetry. 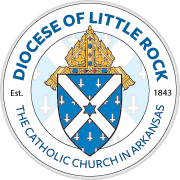 His installation as auxiliary bishop on April 24, 1940, marked the first episcopal consecration to take place in Arkansas. 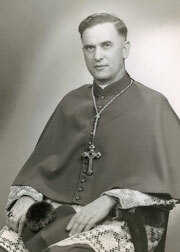 He was installed as bishop on Feb. 11, 1947. After several years of relative calm, the U.S. Supreme Court outlawed segregation in 1954, prompting Bishop Fletcher to issue a pastoral letter stating that the Catholic Church never made distinctions based on race but had provided separate churches and schools for blacks owing to laws and customs. He rebuked the Arkansas governor for acting to block the desegregation of Central High School in 1957. The bishop and his diocesan newspaper, The Guardian, advocated peaceful integration and racial brotherhood. By 1959, all Catholic hospitals in Arkansas had been integrated and black students were attending Subiaco Academy, Catholic High School and Mount St. Mary Academy began accepting blacks in 1962 but few were willing to attend the predominantly white high schools. Over the next decade, several black churches and schools in the state closed. Bishop Fletcher participated in the four fall sessions of the Second Vatican Council (1962-65) and announced the change in language of the liturgy from Latin to English (in America), effective with the first Sunday of Advent in 1964. The bishop declined to establish a role for permanent deacons as Vatican II suggested. He also found himself at odds with the younger priests teaching at St. John seminary — a group more liberal on social and theological questions. After the state’s largest newspaper in the spring of 1967 printed a series of articles by seminary priest that differed with the Catholic Church views on birth control and questioned papal infallibility, Bishop Fletcher announced that the seminary would close. In 1971, Bishop Fletcher declined to vote for a resolution by the American Catholic Bishops calling for an end to the Vietnam War. Fervently anti-communist, the bishop didn’t support amnesty for war resisters and draft dodgers. He turned 75 (retirement age for bishops) on Oct. 28, 1971, and eventually stepped down in July 1972. He died Dec. 6, 1979, in Little Rock after attending a funeral Mass for a friend. See related articles on segregation and black schools in Arkansas Catholic.